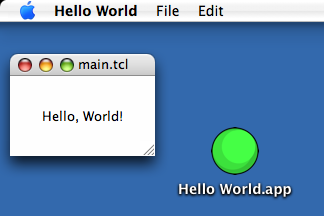 Here is one way to create a self-contained double-clickable Tcl/Tk application for Mac OS X. For clarity, save this and other example files to the Desktop. Download and unzip 8.4.16/tclkit-darwin-univ-aqua from the Tclkit download matrix. This is a universal binary version of the latest stable release of Tcl/Tk with native Mac OS X interface elements. Update: On Mac OS X 10.5 (“Leopard”), at least with current X11 patches, you can use non-Aqua Tclkits as the basis for Mac application packages. X11 will open automatically. Since Tk Aqua doesn’t play well with Leopard, this may prove to be a useful (if ugly) interim solution. Updatier: The Leopard compatibility problems alluded to above appear to be resolved in Tcl/Tk 8.4.17. Tclkits of 8.4.17 and the official 8.5.0 release are now available. Updatiest: You can now build your own tclkits with ease using the Kitgen Build System. Make an executable copy of the Tclkit. The duplicate is needed because Tclkit is used both to execute SDX and as input to SDX. It cannot otherwise operate on itself. Different Tclkits can be used to create executables for different platforms. Omitting the -runtime argument creates a platform-independent Starkit which can be executed by an external Tclkit. Instead of qwrap, more complex projects can use the wrap command to package their entire directory structure as a virtual filesystem. Img2icns is a handy utility for converting images to icns files. Create a folder called Contents inside the package, and two folders titled MacOS and Resources within Contents. Drag hello.icns into Resources and the hello executable into MacOS. Every application contains a file that lists certain application properties. Because some properties identify the very components that comprise the application, the application won’t work without this vital file. Here is an example Info.plist. Place this file in the package’s Contents folder. Note that the CFBundleExecutable property identifies the executable (found in MacOS) and that CFBundleIconFile identifies the application icon (found in Resources). The CFBundleIdentifier and CFBundleSignature properties should be unique to your application. The CFBundleGetInfoString, CFBundleShortVersionString, and CFBundleVersion properties specify your application’s version. Consult Apple’s Property List Key Reference for more details about these and other possible application properties. As XML files, property lists can be edited with text editors or Apple’s dedicated Property List Editor (included with the developer tools). The default menu bar items and window title are provided by Tk. The internal main.tcl filename is introduced by qwrap. So, that’s a tidy way to package a Tcl/Tk program for Mac OS X deployment. The application package is really just a few folders, an icon, and a property list wrapped around a Starpack. 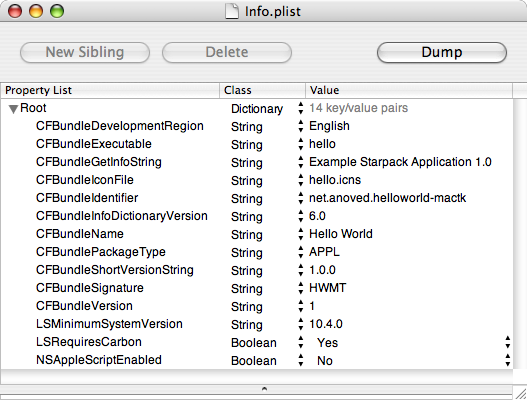 If you’re already using Starkits, you’re only a few steps away from delivering a relatively well-integrated Macintosh version of your application. The technique described here is largely inspired by Kevin Walzer’s How to Build Tcl/Tk Application Bundles the Mac Way tutorial. The companion article on Tk Aquafication offers more guidance on integration with Macintosh interface conventions. The example Info.plist is based on the property list included in the Tcl/Tk Aqua 8.4.16 standalone Wish Shell, which I cannot find listed on any relevant web sites. As with other recent releases, it seems to be available only by direct download from mailing list announcements. Posted on Saturday, December 8th, 2007. Tags: code, mac, tcl. Posted by Jim on Thursday, March 27th, 2008 at 5:49 PM. This is essentially the same technique that Starpacker uses when the “Create Mac OS X application package” option is selected. Posted by iperkeno on Thursday, November 25th, 2010 at 7:56 PM. it’s great and I was able to add icon to my wrapped app in few minutes.